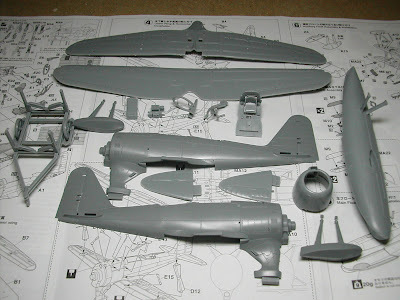 The nice thing with a Hasegawa kit is that you can relax and just stick it together, tootling along with the exploded diagrams and half your mind elsewhere. It makes adding a little extra detail a breeze - some extra plumbing or wiring, or some seat belts. 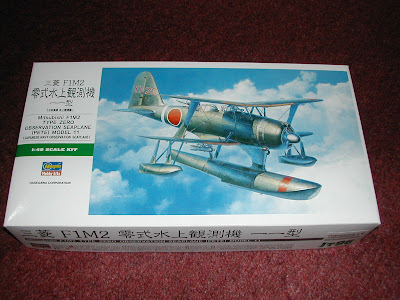 I just made a start on Hasegawa's new F1M-2 Seaplane, and it's lovely. It has beautifully engraved panel lines, perfectly fitting parts, and great convex panelling on the 'fabric' wings. If there's any disappointment, it is restricted to the photo-etched parts. These are referred to throughout the instructions, as a replacement of parts in the cockpit, but comprising the rigging. Unfortunately, they don't come with the kit. Why not? Why don't Hasegawa include them with the kit and boast this on the box, and thereby polishing their reputation? Why spoil the model for a h'aporth of rigging? Instead the metal parts 'may be purchased separately' at extra expense. This is ok for the interior parts, but the plane needs the rigging. Fortunately, I am stubborn and experienced, so I can make my own. Here are some photos of most of the main parts made up into sub-assemblies. The centre float calls for 20gms of weight, which I have duly added. 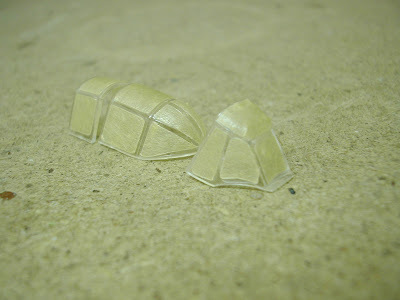 The transparencies are very nice indeed, seen here masked and ready for paint, as are the other interior parts. More on this project soon.